This was the second memory section of the Bible I learned in primary school after the Lord's Prayer, and in the darkness of many nights as a child and later as an adult, they comforted me time and again. Even though I loved Jesus and asked Him in to my heart at age 9, I didn't truly 'know' Him until 1991 when at age 32 I fell head over heels for my Saviour King and promised to follow Him all the days of my life. It was only then that I realised He'd been listening as I prayed the Lord's Prayer each night for the past twenty three years, that He'd heard me sing the 23rd psalm over and over when fear and anxiety stormed my life, that He'd caught every tear and done all He could to draw me out of darkness and into relationship with Him. All that time He'd waited for little ol' me. For twenty three long years the Lord's Prayer and the 23rd Psalm were my anchors, what I clung to for hope and comfort, but now I embraced Jesus as my true anchor, my fulfilled hope, my greatest source of comfort. After what seemed like a lifetime crying out with pain, loneliness, fear and uncertainty, Jesus became my healer, my source of living water, life everlasting, goodness and mercy. This week I read Psalm 23 for the first time in ages and my eyes welled with tears. Looking back on 26 years walking with Jesus I was overcome with the deepest emotions of gratitude and love for the steadfast assurance of what lies ahead...dwelling in the house of my Lord forever. I truly pray that you know just how deeply He loves you too and if perhaps you've forgotten, that He would remind you as only a Saviour can. I learned to sing this psalm at a very young age. I sang the descant and truly there are times that this psalm has maintain my sanity. It is so beautiful. I have memories of singing in churches, choirs and at home. He does walk with us. Awe Jenny your posts are beautiful to both the eyes and the soul. I chose my Instagram/blog name as Created and Beautiful to best describe the Love I know in my Saviour Jesus. It also extends to my love of crafting/quilting. 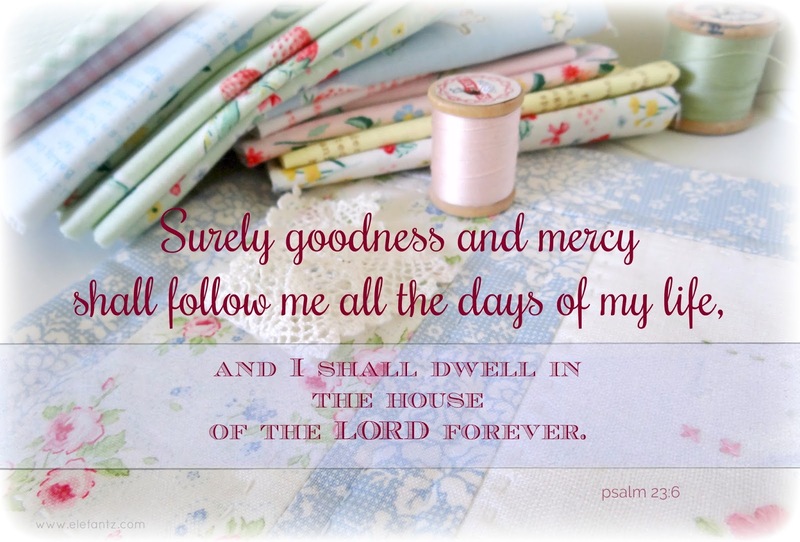 I have chronic fatigue and severe fibromyalgia and had to give up my job as a Registered Nurse but God has filled me with His promises and has filled my life with physical friends and people I've met thru blogs, Instagram and quilt alongs who fill my love with beauty, promise and hope. You are one of the blogs I go to and know I will find inspiration and beauty. Keep doing what you are doing and may God abundantly bless you with the ability to do so.